As of the 2018–19 season, there are eleven teams playing in professional leagues in London, six play in the Premier League and five in the Football League. Wembley Stadium is also marked. Football is the most popular sport, both in terms of participants and spectators, in London. London has several of England's leading football clubs, and the city is home to thirteen professional clubs, several dozen semi-professional clubs and several hundred amateur clubs regulated by the London Football Association, Middlesex County Football Association, Surrey County Football Association and the Amateur Football Alliance. Most London clubs are named after the district in which they play or used to play, and share rivalries with each other. In the 1989–90 season, eight of London’s eleven professional clubs were in the top tier of English Football at the same time, forming 40% of the First Division that season. Fulham were founded in 1879 and are London's oldest club still playing professionally. Royal Arsenal were London's first team to turn professional in 1891. They became Woolwich Arsenal in 1893, and then became just Arsenal in 1913. They are London's most successful team with 43 honours. Arsenal are only the second English club (after Preston North End of 1888–89), and the only London club to go an entire League season unbeaten, in the 2003–04 season. Arsenal have won The FA Cup a record 13 times; they were the first London team to win the Football League First Division in the 1930–31 season and the first London club to win the Premier League in the 1997–98 season. Chelsea are the only London club to win the UEFA Champions League, which they did at the 2012 tournament. On 15 May 2013, Chelsea won the UEFA Europa League to become one of five clubs to win all three main UEFA club competitions. Chelsea are also the only London club to participate in the FIFA Club World Cup. They were runners-up in 2012, losing to Corinthians of Brazil in the final. Tottenham Hotspur were the first club in Britain to win a European trophy, winning the Cup Winners Cup in 1963. Arsenal, Chelsea and Tottenham Hotspur are London's most successful teams. Between them, they have won a total of 99 titles and trophies. Wembley Stadium, England's national stadium, is in London. It is the home venue of the England national football team and has traditionally hosted the FA Cup Final since 1923. The playing of team ball games (almost certainly including football) was first recorded in London by William FitzStephen around 1174—1183. He described the activities of London youths during the annual festival of Shrove Tuesday. "After lunch all of the city's youth would go out into the fields to take part in a ball game. The students of each school have their own ball; the workers from each city craft are also carrying their balls. Older citizens, fathers, and the wealthy would come on horseback to watch their juniors competing, and to relive their own youth vicariously: you can see their inner passions aroused as they watch the action and get caught up in the fun being had by the carefree adolescents." Regular references to the game occurred throughout the fourteenth and fifteenth centuries, including the first reference to the word "football" in English when it was outlawed by King Henry IV of England in 1409. Early games were probably disorganised and violent. In the sixteenth century, the headmaster of St Paul's School Richard Mulcaster is credited with taking mob football and transforming it into organised and refereed team football. In 1581 he wrote about his game of football, which included smaller teams, referees, set positions and even a coach. The modern game of football was first codified in 1863 in London and subsequently spread worldwide. Key to the establishment of the modern game was Londoner Ebenezer Cobb Morley who was a founding member of the Football Association, the oldest football organisation in the world. Morley wrote to the Bell's Life newspaper proposing a governing body for football which led directly to the first meeting at the Freemasons' Tavern in central London of the FA. He wrote the first set of rules of true modern football at his house in Barnes. The modern passing form of the game was invented in London in the early 1870s by the Royal Engineers A.F.C. Prior to the first meeting of the Football Association in the Freemasons' Tavern in Great Queen Street, London on 26 October 1863, there were no universally accepted rules for the playing of the game of football. The founder members present at the first meeting were Barnes, Civil Service, Crusaders, Forest of Leytonstone (later to become Wanderers), N.N. (No Names) Club (Kilburn), the original Crystal Palace, Blackheath, Kensington School, Percival House (Blackheath), Surbiton and Blackheath Proprietary School; Charterhouse sent its captain, B.F. Hartshorne, but declined the offer to join. All of the 12 founding clubs were from London though many are since defunct or now play rugby union. A rise in the popularity of football in London dates from the end of the 19th century, when a fall in church attendance[specify] left many people searching for a way to spend their weekend leisure time. In 1882 the London Football Association was set up. Over the next 25 years clubs sprang up all over the capital, and the majority of these teams are still thriving in the 21st century. Of those clubs currently playing in the Football League, Fulham is generally considered to be London's oldest, having been founded in 1879. However, Isthmian League side Cray Wanderers is the oldest extant club in all of the Greater London area, having been founded in 1860 in St Mary Cray | (then part of Kent but now in the London Borough of Bromley). Bitter rivals Millwall and West Ham United playing in the 1930 FA Cup at Upton Park. Initially, football in London was dominated by amateur teams, drawing their membership from former public schoolboys but gradually working-class sides came to the forefront. Royal Arsenal was London's first professional team, becoming so in 1891, a move which saw them boycotted by the amateur London Football Association. Other London clubs soon followed Arsenal's footsteps in turning professional, including Millwall (1893), Tottenham Hotspur (1895), Fulham (1898) and West Ham (1898). In the meantime, Woolwich Arsenal (formerly Royal Arsenal) went on to be the first London club to join the Football League, in 1893. The following year, the Southern League was founded and many of its members would go on to join the Football League. In 1901 Tottenham Hotspur became the first club from London to win the FA Cup in the professional era, although it would not be until 1931 that a London side would win the Football League, the team in question being Arsenal (having moved to Highbury in 1913 and dropping the "Woolwich" from their name). Historically, London clubs have not accumulated as many trophies as those from North West England, such as the 52 top-league English championships won by Liverpool, Manchester United, Everton and Manchester City; however, in the thirteen consecutive seasons since 2005–06, Arsenal, Chelsea, and Tottenham have consistently finished in the top six of the league table (92% top six finishes, after accounting for a Tottenham 8th, a Chelsea 10th and a Tottenham 11th) and are regarded as three of the Premier League's current "big six" alongside Liverpool, Manchester United, and Manchester City. In the two seasons immediately proceeding the start of this top six run, Arsenal and Chelsea became the first pair of London clubs to finish first and second in the top flight, with Arsenal winning in 2003–04, and Chelsea winning in 2004–05. The 2009–10 season saw Chelsea (1st), Arsenal (3rd) and Tottenham (4th) all finish in the top four, qualifying all three of these London teams into the same UEFA Champions League competition. Before the 1996–97 season, when Chelsea started its run of consistent high finishes, the two highest profile London clubs were Arsenal and their long-standing North London rivals Tottenham Hotspur, both of whom were considered to be members of English football's "big five" (with Manchester United, Liverpool and Everton) for much of the post-war period. As of the end of the 2016–17 season, all three clubs were in the top ten in the all-time top-flight table for England – Arsenal at second overall, Chelsea at seventh overall and Tottenham at eighth overall. The table below lists all London clubs in the top eight tiers of the English football league system: from the top division (the Premier League), down to Step 4 of the National League System. League status is correct for the 2018–19 season. Stadiums and capacity are of 1 May 2017. Arsenal Emirates Stadium 60,600 1899 London's first professional club, originally based in Woolwich. First London team to become English League Champions, in 1931. Record FA Cup winners with 13 titles. Chelsea Stamford Bridge 41,798 1889 Won the last ever FA Cup final at the old Wembley in 2000 and first at the new stadium in 2007. First London club to win the UEFA Champions League in 2012. Crystal Palace Selhurst Park 26,309 1889 A Crystal Palace team established in 1861 were FA founder members. Fulham Craven Cottage 25,700 1879 Oldest London club in the Football League. West Ham United London Stadium 60,000 1895 Founded as Thames Ironworks. Played at the Boleyn Ground from 1904 to 2016, before moving to Stratford. Brentford Griffin Park 12,763 1889 Founded to serve as a winter pursuit for the Brentford Rowing Club. Millwall The Den 20,146 1885 Founded in East London on the Isle of Dogs, moved south across the river to Bermondsey in 1910. Queens Park Rangers Loftus Road 18,360 1899 Have had at least fifteen different home stadia. AFC Wimbledon Kingsmeadow 4,850 2000 Formed by fans of Wimbledon in protest after the club announced relocation to Milton Keynes. Won promotion to the Football League in their ninth season. Currently building a new ground near the former home of Wimbledon F.C., and plan to move there during the 2019–20 season. Now tenants of Chelsea, which purchased Kingsmeadow as part of the financing process for the new ground. Charlton Athletic The Valley 27,111 1889 Won FA Cup in 1947. Have ground-shared at Selhurst Park and the Boleyn Ground. Barnet The Hive Stadium 5,100 1888 First London team to be promoted from the Football Conference into the Football League, in 1991. Dagenham & Redbridge Victoria Road 6,078 1889 Formed through a merger of Dagenham (formed in 1949) and Redbridge Forest (1979), which in turn was formed through successive mergers of Ilford (1881), Leytonstone (1886), and Walthamstow Avenue (1900). Leyton Orient Brisbane Road 9,271 1881 Leyton Orient was originally formed by members of the Glyn Cricket Club. Wealdstone Grosvenor Vale 3,607 1889 First ever non-League team to achieve the double of FA Trophy and Football Conference title in the same season, in 1985. Welling United Park View Road 3,500 1889 Took over the ground that used to be played on by defunct club Bexley United. A.F.C. Hornchurch Hornchurch Stadium 3,500 1889 Founded as successors to Hornchurch F.C. Enfield Town Queen Elizabeth II Stadium 2,500 1889 Founded by supporters of Enfield protest against the club owners' actions. Kingstonian Kingsmeadow 4,850 1885 Currently tenants of Chelsea. VCD Athletic Oakwood 1,180 1889 Formerly named Vickers, Crayford & Dartford Athletic F.C. Hayes & Yeading United SkyEx Community Stadium 2,500 1889 Formed through a merger of Hayes and Yeading. Cray Wanderers Hayes Lane 6,000 1860 Oldest club in Greater London. Currently tenants of Bromley. Redbridge Oakside 3,000 1889 Formerly named Ford United F.C. Thamesmead Town Bayliss Avenue 6,000 1889 Formerly named Thamesmead F.C. Corinthian-Casuals King George's Fields 2,700 1889 Formed through a merger of Corinthian (formed in 1882) and Casuals (1883). Below the eighth tier, London Clubs are represented within the Combined Counties League (SW), Essex Senior League (NE), Southern Counties East Football League (SE) and the Spartan South Midlands League (NW). Casuals ? 1878 1939 Founder members of the Isthmian League in 1905 and won the FA Amateur Cup in 1936. Merged with Corinthian to form Corinthian-Casuals. Clapham Rovers Clapham Common 1869 1911 Former FA Cup winners. Scorers of the first ever FA Cup goal. Leyton 1882 1939 Rarely partook in competitive matches yet defeated many strong teams, often by a wide margin — e.g. FA Cup holders Blackburn Rovers 8–1 (1884) and Bury FC 10-3 (1903). Merged with Casuals to form Corinthian-Casuals. Croydon Athletic KT Stadium 1986 2011/2012 Supporters of the defunct club and some of the old club management and officials formed a new member owned, fan owned, club — AFC Croydon Athletic. Croydon Common Croydon Common Athletic Ground 1897 1917 The only First Division club not to return to action after World War I.
Croydon Municipal Croydon Arena 2009 2010 Offshoot of Croydon FC. Withdrew from the league at the conclusion of their first season. Ealing Various in West London, including Wembley Stadium 1905 2013 Founding Member of the Ishmian League. Southern Amateur League and Amateur Cup double in 1927. Folded due to sad demise of long term team officials and increased costs. First amateur team to play at Wembley. Played 8 home games there in 1928. Edgware Town White Lion Ground (Now at Silver Jubilee Park, Kingsbury) 1939 2008 (Reformed 2014) At the end of the 2007-08 season, Edgware Town were forced to resign from the Isthmain League Division One North when lack of funds meant that the club were unable to confirm a new ground for the following season after their lease at the White Lion ground had expired. Fisher Athletic Champion Hill 1908 2009 Once tenants of Dulwich Hamlet. A new fan-owned club, Fisher F.C., was formed. Hayes Church Road 1909 2007 Merged with Yeading to form Hayes & Yeading United. Leyton Leyton Stadium 1868 2011 In January 2011, after a short suspension from the league for not paying its subscription, the club was forced to withdraw from the Isthmian League Division One North division due to debt. Nunhead F.C. Brown's Ground (also known as 'Nunhead Sports Ground') 1888 1949, with day-to-day operations ceasing at the end of the 1940-41 season Founded as Wingfield House Football Club in 1888, the name was changed to Nunhead F.C. in 1904. Thames West Ham Stadium 1928 1932 Members of the Football League between 1930 and 1932. Upton Park West Ham Park 1866 1911 Represented Great Britain at the 1900 Summer Olympics football tournament, winning the gold medal. Wanderers The Oval and others 1859 c.1887 Winners of the first ever FA Cup. Wimbledon Plough Lane, Selhurst Park 1889 2004 Moved to Milton Keynes in 2003, renamed Milton Keynes Dons in 2004. AFC Wimbledon formed in 2002 by the majority of its former fans. Yeading The Warren 1960 2007 Merged with Hayes to form Hayes & Yeading United. There are also a huge number of minor London clubs playing outside the top eight levels of English football. Hackney Marshes in east London, home to many amateur sides, is reportedly the single largest collection of football pitches in the world, with 100 separate pitches. The figures in bold represent the most times this competition has been won by an English team. Shared Community Shield results listed as wins. * The Fairs Cup is not considered a UEFA competition, and hence Arsenal's record in the Fairs Cup is not considered part of its European record (although it won it in 1970, at a time when participation was based on league position). Arsenal playing Chelsea - two of London's most successful FA Cup teams. London 15 (9) Chelsea (2), Crystal Palace (2), Fulham (2), Queens Park Rangers (2), Tottenham Hotspur (2), West Ham United (2), Brentford (1), Charlton Athletic (1), Millwall (1). Wembley Stadium, in north-west London, is the national football stadium, and is traditionally the home of the FA Cup Final as well as England's home internationals. The old stadium was closed in 2000 in order to be demolished and completely rebuilt, and reopened in 2007; during the closure Cardiff's Millennium Stadium was the venue for cup finals, while England played at various venues around the country. Wembley was one of the venues for the 1966 FIFA World Cup and the 1996 European Football Championship, and hosted the final of both tournaments. It also was the venue for the European Cup final in 1968, 1978, 1992, 2011 and 2013. With a 90,000-capacity, it is the second largest stadium in Europe. Most clubs in London have their own stadium, although some clubs share, and some clubs may temporarily take up a tenancy at another's ground due to their own ground being redeveloped. The largest operational football stadium in London apart from Wembley is Tottenham Hotspur Stadium, with a capacity of 62,062. Other large stadiums include , Arsenal's Emirates Stadium (60.355), West Ham United's Olympic Stadium (60,000), Chelsea's Stamford Bridge (41,798). There are 10 stadiums in London with capacities over 10,000. 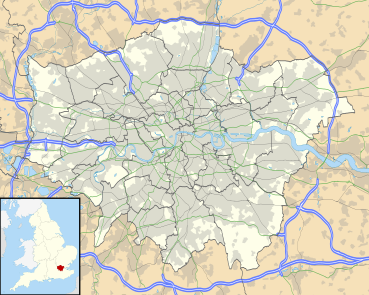 London is the location of the headquarters of the Football Association, at Wembley Stadium (formerly Soho Square and Lancaster Gate), while the Premier League's offices are located in Marylebone. The Football League maintains its headquarters in Preston, although its commercial offices are based in Marylebone as well. ^ a b "London :: Football". Encyclopædia Britannica. Retrieved 15 November 2013. ^ "Football Clubs in London - Professional & amateur London football". www.first4london.com. Retrieved 1 October 2010. ^ Wall, Sir Frederick (2005). 50 Years of Football, 1884-1934. Soccer Books Limited. ISBN 1-86223-116-8. ^ "Early History of Football". The Encyclopedia of British Football. Archived from the original on 18 April 2007. ^ "Football in London". Life in London Magazine. ^ Lindsay, Richard (1991). Millwall: A Complete Record, 1885–1991. Breedon Books Publishing Co Ltd. ISBN 1-85983-833-2. Retrieved 28 February 2014. ^ "125 years of Arsenal history - 1891-1896". arsenal.com. Archived from the original on 9 August 2016. ^ "England - First Level All-Time Tables 1888/89-2016/17". RSSSF. Retrieved 2018-07-04. ^ a b c Blakeman, Mick (2000). Nunhead Football Club 1888-1949. The Book Factory, London. ISBN 1874427534. "Ossie's Dream (Spurs Are on Their Way to Wembley)"
"When the Year Ends in One"
This page was last edited on 17 April 2019, at 19:56 (UTC).